Save fuel & maintenance costs. Limit winter idling to 10 minutes. During warm weather, idling is never necessary. Shutting down will save money, conserve fuel and preserve the environment. Idling can use up to a gallon of fuel per hour. Idling causes greater engine wear, resulting in higher maintenance costs. Help remind coworkers to Break the Habit! 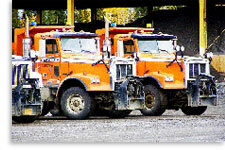 It’s estimated that the department’s 8-Cubic Yard trucks idle an average of 70,000 hours per year. At $4/gal, that equals $280,000 for one class of vehicle idling each year. A 30% idle reduction equals more than $80,000 in fuel savings. 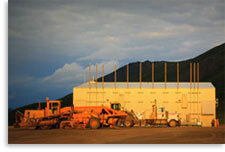 Heavy equipment preventative maintenance service schedules are based on hours – not miles. 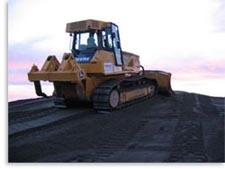 Excessive idle contributes to additional maintenance costs which can be significant for heavy equipment. 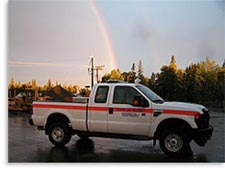 A typical heavy equipment PM service costs $3,000. Reducing idle time by 30% will reduce the number of PMs on fleet vehicles and can save well over a million dollars a year. 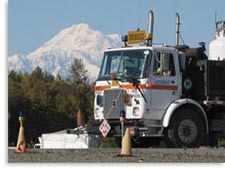 Unnecessary idling contributes to environmental problems such as poor air quality. Idling time of 3-5 minutes is all that is required to properly cool an engine after being under heavy load. Idling causes greater engine wear and tear over time, which results in higher maintenance costs. According to the American Trucking Association, such wear can increase maintenance costs by almost $2,000 per year and shorten the life of the engine. Idling in Tier 3 or 4 diesel engines reduces the proper function of the emission control system and can cause filters to become plugged resulting in an expensive repair. Idling for more than 10 seconds uses more fuel than restarting your engine. Idling causes spark plugs to become dirtier more quickly. This can cause an increase in fuel consumption by 5%. Excessive idling lets water condense in the vehicle’s exhaust system, which can lead to corrosion. Myth: The engine should be warmed up before driving. Reality: The best way to warm up your vehicle is to drive it gently. Even in cold weather, you need no more than 30 seconds (or just long enough to defog the windshield) of idling before driving your vehicle. Reality: An idling engine will leave soot deposits that can build up and cause oil contamination. This can damage engine components, including cylinders, spark plugs and exhaust systems. This is also true for diesel engines. Myth: Shutting off and restarting your vehicle is hard on the engine and uses more gas than if you leave it running. Reality: Frequent restarting has little impact on engine components like the battery and the starter motor. Component wear caused by very frequent restarting of the engine is estimated to add only $10 per year to the cost of driving. Myth: Remote control engine starters are great for warming your engine in winter. Reality: Remote starters waste fuel. Plugging in an electric engine block heater on a timer so your car is ready when you come out saves fuel and doesn't wear your engine. If you must use a remote starter then turn it on only after your coat and boots are on and you have stepped outside. Myth: Drive throughs are efficient ways to get your banking done and grab a coffee. Reality: Any time your engine is idling, money and fuel are being wasted. Frequent restarting has little impact on engine components like the battery and the starter motor. Component wear caused by very frequent restarting of the engine is estimated to add a minuscule $10 per year to the cost of driving. 7-Mile M&O Yard in Juneau. 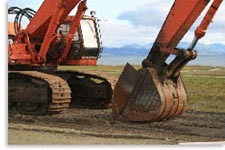 Heavy equipment in Goodnews Bay. MSCVE's heavy capacity scale test truck. State of Alaska pickup truck. Operating against a brilliant sunset. Tazlina DOT yard & equipment.